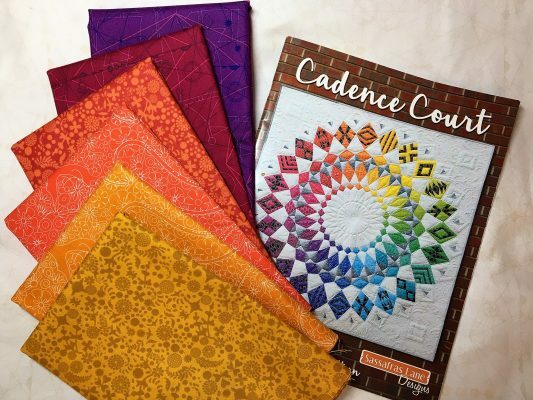 The Cadence Court quilt comes to life with vivid colors and a neutral background. Hello everyone! 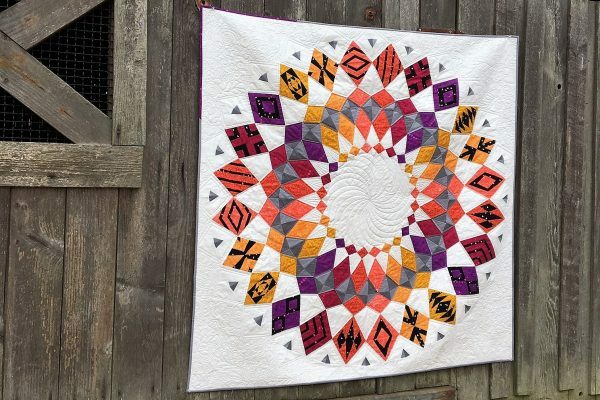 Are you ready to make a stunning quilt using the foundation paper piecing method? Over the next several blog posts, follow along with me while I construct a Cadence Court quilt. This quilt is good for confident beginners, whether you have paper-piecing experience or not. 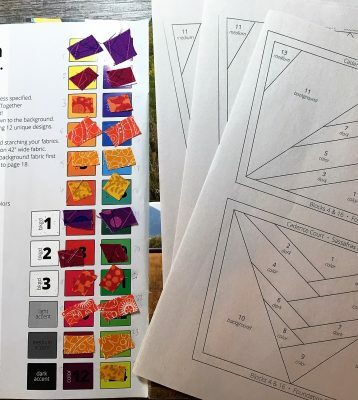 The designer, Sassafras Lane Designs, does provide basic paper-piecing instructions as well as a coloring diagram to help you plan your quilt. The background fabric is a single white Alison Glass print. In the book, there are instructions for using 3 background fabrics, but I simplified by using one background. If you use multiple background fabrics, be sure to select similar values to keep the focus on the colorful wedges. For the dark fabric, I’m using a rose gold heart print on a black background from the “Yes, Please” line by Riley Blake. The light and medium fabrics are two solid greys. You can make this quilt with so many different color schemes! On page 2, the Introduction section provides some handy tips and a color swatch chart. I do recommend starching your fabrics just to help stop any fabric stretching. I also use two thread colors in a 50-weight or finer: a white and a black. I used white anytime I sewed pieces to the white background and black when sewing the colorful wedge segments to the dark pieces. If you use white thread on the dark pieces, your white thread will show and vice versa, so be careful! 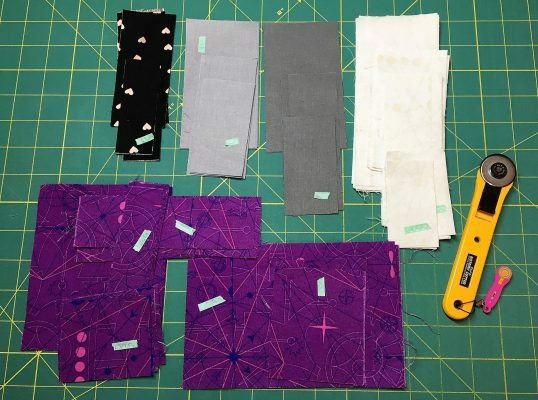 Use the color swatch chart and glue small pieces of your fabrics to keep track of everything. I copied the wedge segments onto paper designed for foundation paper piecing. It is thinner than normal copy paper and helps to keep your designs crisper. Take the time to get organized…you’ll be glad you did! I started by constructing the first wedge to get a feel for the pattern. Cut out all the fabric pieces for wedge 1 and label them. Cutting and labeling will help you get started. In the next blog post, I’ll provide some construction tips for the wedges. This entry was posted in Quilting, Tutorials and tagged Cadence Court, paper piecing. Jennifer Ball is a modern quilter based in Portland, Oregon, with a passion for foundation paper piecing. When she's not quilting, you can most often find her hiking, camping, and visiting the national parks with her husband, son, and dog!